Discussion in 'Lighting and Electrics' started by TNasty, Apr 7, 2017. I've been playing around in the EOS software for the past couple days just to familiarize myself with some of the more advanced features that I never got the chance to play around with. So in just a couple days I'll be doing the lighting for a big event the school does every year (they call it "Mr. Central", where several Senior guys perform in several talent and comedy acts in an attempt to win, you might have had something like it in high school or college or something), and I'm going to be working with an assortment of classic halogen fixtures, a couple LED par cans, and one Technobeam-i. I've done lighting arrangements using all the fixtures I wanted to before, but I'm pretty sure I can do stuff more efficiently. Who here has some tips for quickly and effectively putting moving lights into cues on an Express (or similar board)? @TNasty , we just happen to have a collaborative article on that topic: https://www.controlbooth.com/threads/programming-moving-lights-on-an-etc-express-ion.13796/ . I don't think it's been updated since 2009, but then, neither has the Express! Read through it, and feel free to ask specific questions here. My biggest advice: learn to love and use focus points for much more than just focus. For the longest time, I thought they acted the same as groups, until I learned about the [Only] key. That changed my way of thinking forever. RonHebbard and TNasty like this. Thanks for that, @derekleffew, I think I stumbled across that back when I was setting up the Technobeams, but didn't really read on into the "usage" section of the article. Although I was able to understand focus points a little better after reading it. Say there's cue 700, where the light is in position A with parameters X. The next cue in the list, 701, has the light in position B with parameters Y.
I would then typically go back and set the times and follows once I had everything in. I have to do it this way to avoid the light giving an unwanted light show for the entirety of the fade. I have to be doing this wrong, there is a little easier way to accomplish this that I'm just not aware of, isn't there. There's not really a good way. Desk doesn't support concept of move in black, though I'm not sure how to do it on a more modern board without a light show or additional cues either, because its going direct from one position to another while remaining lit. Yeah the express was intended more for conventional lights, its meant for theatre and back in the day that's just how it was done. Its all about the programmer going and doing those steps manually. 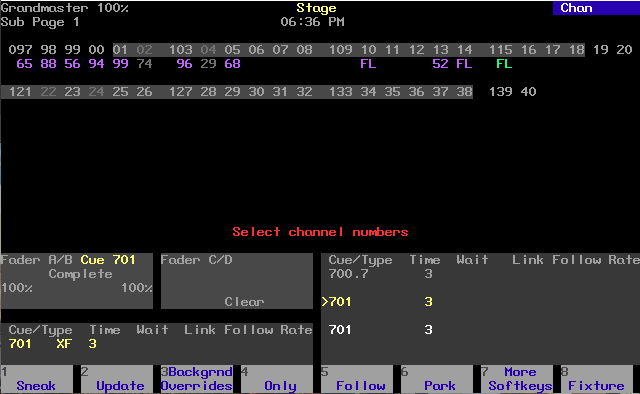 Record the cue, step back and move the fixture to match, set the colour to match, etc. Had to do it with I-Cues and scrollers all the time back when I had to run an express way back when (think I haven't used one in like 8 years or something). @Dionysus You're making 8 years sound like an eternity. To many of us here, compared to wicking whale oil, the Express is recent history. Dionysus and Les like this. Did not mean to infer that. Ive been doing this long enough to remember when the express was BRAND NEW and SHINY. However it was before very many light boards thought much about modern ways to deal with multi-parameter fixtures too much. Of course there were some, like @ATT on the Strand consoles which was awesome for scrollers and such. The 500 series had room for 99 Profiles! Auto-Mark was not yet a thing. Heck I started out with the likes of the Mantrix II and Lightboard M myself. But you have to admit that there have been some wonderful developments in the last 10 years that a lot of people in the industry take very much for granted. They don't know what things were like before RGBAW LEDs, the Grand MA2 and ION. Touring boards were resistance. Neither AMX nor DMX were on the horizon. Neither @derekleffew 's nor @JonCarter 's parents had met yet. Enough of this swerve. In all seriousness; My first board was imported from England, had 8 1.5K resistance plates and my first memory board was a Strand Century (Canadian) IDM-Q spitting out 0 to 10 VDC to its 100 Century Strand (American) 6 KW dual SCR dimmers. JohnD, TNasty, Dionysus and 1 other person like this. I haven't even been privileged to work with RGBAW or anything newer/nicer than our Express, but I have made a $15 UMB-DMX adapter and fooled around with it for an hour or two. Although, I am going to challenge myself to not use the channel faders at all, just so I feel like I'm on a more expensive board. The only exception might be mixing the RGB PAR cans, due to the lack of encoders. I'm also going to record myself doing all of it so that I can leave it as a study video for those interested, and to show off my keystrokes. God I love the keys on the Express. Go to YouTube and search for ETC Express Tutorials. There is a wealth of knowledge there. Heck, even just googling the user manual was useful. Just last Monday my fellow tech and I were plopped down in front of an express for the Sears Drama Festival with a hosting tech who despite his best efforts, wasn't able to clearly explain how to use the board. We googled the PDF and sure enough, a few minutes later my fellow tech had aquainted himself and was making the 31 scenes the one act play has. I learned an interesting trick for making mark cues on the express when I had to reprogram an entire show that wasn't saved the night before opening (I wasn't involved with the show until that night). The LD kept the only backup disk in case the theatre decided not to pay him, and no one else thought to make a backup copy. He went out of town, so we skyped and he watched from the skype cam as I reprogrammed the show. You want to make two groups. The first group will be all moving light parameters excluding intensity, let's call this GROUP 1. The second group will be all moving light intensity channels, we'll call this GROUP 2. What you do is program your show as normal. 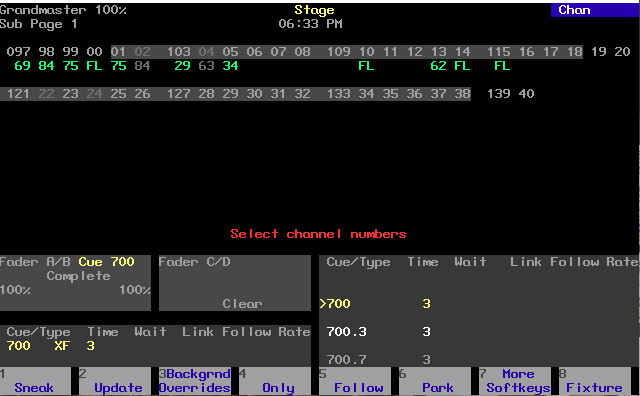 Set moving light positions and intensities for each desired cue. Don't worry about making focus points unless you want to. You won't use them later for making mark cues, at least I didn't with this method. Invariably, positions will need to be adjusted. Don't worry about making mark cues until after your look is set. When you have a cue made and you need to make a mark cue previous to it, type GROUP 1 RECORD FOCUS X where X is a number between 1-99 that you haven't used yet. Let's say 1-9 are your basic positions that you used to program the show. So start at 11. This will record all the moving light parameters EXCEPT intensity into the focus point. Back up a cue. If your movers are on and you don't want a live move, type GROUP 2 AT 0 ENTER RECORD <current cue>.1 ENTER. Add a follow of the cue duration. Then type GROUP 1 FOCUS X ENTER where is the focus point you made previously. Record this cue as your .2. Add a follow. I'd make this cue time short, 2s or less. However long the minimum time it takes for your movers to move into position as fast as possible. I guess it depends how quickly you need it to move into position though. You don't really have to do all these point cues if you have several cues when the movers aren't on. You can just record the new position into a cue and track their changes through to the current cue so that the only value that changes in the cue that comes up is their intensity. I hope this makes sense. I haven't really touched an express in 4 years or so. I have a few sets of the Express DVDs left on a shelf. Contact me if you are interested in a set (include an address). TNasty and JohnD like this. That pretty much made sense. Just record as normal, and then go back with a focus point that acts as a shutter override to make the "transition" cues. I think I just found one in my booth, so I'll see how much that covers. It would certainly be good to have for anybody who's interested in working with my system after I graduate this year. People are a bit scared by the size of the PDF version of the manual, let alone the actual hard copy of the manual itself. Man, I've got a lot to document regarding my the auditorium's configuration. I've learned quite a bit in 1 1/2 years working with it, and I'm pretty sure there's still stuff I haven't figured out regarding it. UPDATE: Forgot to mention that yesterday I managed to use none of the individual channel faders (excluding the ones for the two RGB PAR cans I had), and only use submasters and the channel capture functions. 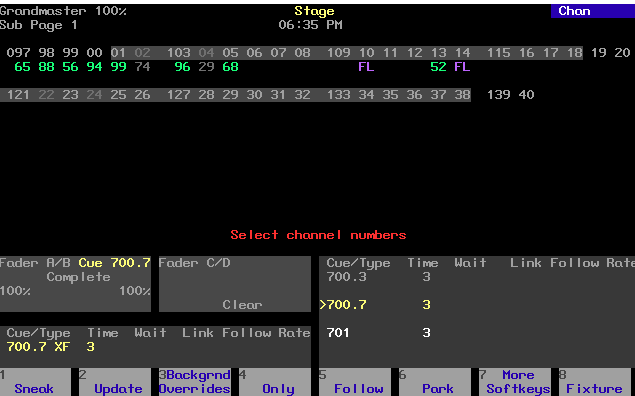 I actually got along pretty well, since all of the channels are marked with their general function (IE CDSL for Cool downstage left). One more question. A friend and I are planning on retrofitting a 200w LED into an old Technobeam. In order to power the units, I need to set a constant value on the digital 120v dimmers. When I park a dimmer on the console, does it automatically release it when I turn off the board? It's just a pain to go and turn the stuff on and off at the dimmer rack. Looking on the 'bright' side, if all goes well, that will be quite powerful. Don't worry, we've got the whole circuit thing figured out. I've found one driver that's rated for 200w at the right voltage for the LED, although I'd prefer to not spend $60 on the power system if I can avoid it. I figured if I could fit an LED that pushes 24-28000 lumens into it for about $100 instead of getting a $100 metal halide that's only 18000 lumens that'll need to be replaced in the foreseeable future. And as an added perk, the LED won't have to cool back down like the halide does before turning back on. When I said "digital dimmer", I was referring to the kind where it's primary function is a non-dimmable 120vac line for powering things like moving lights or effects that use a regular outlet (like a fountain or disco ball) via DMX control. Anywho, I'll give the parking a try later today. It would just be great to eliminate a step for using the fixture, especially due to the continuous flow of technicians. Too bad there isn't an option for a power-off macro. 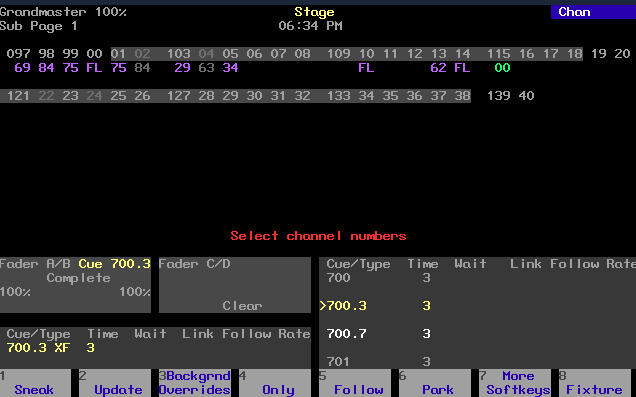 ...since all of the channels are marked with their general function (IE CDSL for Cool downstage left). Something to consider...majority of the time, location comes before color, i.e., DSL-W, DSL-C, rather than W-DSL, C-DSL. Probably, but it depends on your particular rack's "DMX loss behavior." Almost every manufacturer has a "hold last look" feature, and the duration may be user-adjustable. On a Sensor CEM, the time-out is from 1-999 seconds (16min., 39sec.). After the time-out period, the dimmers will perform a fade to black in 5 seconds. * Alternatively, a time-out of 0 (zero) will hold last look indefinitely. *This is but one of many, many reasons NOT to use a dimmer to power non-incandescent loads. Thanks for all of that. I'll give our dimmer rack a check to see what it's set for (it's a CEM+, if that changes anything that much). Those "digital" dimmers aren't analogue, they're either on at full, or completely off, non-dimmable. ...Those "digital" dimmers aren't analogue, they're either on at full, or completely off, non-dimmable. Then they're not dimmers; they're relay modules, probably model# R20.